The 2016 edition of the Agency Business Report will be bigger, better, and even more global - make sure your agency is a part of it. NEW YORK: From revenue to staff, expansions to acquisitions, account wins and losses to key hires and departures, if it happened in the PR agency world in the past year, you’ll read about it in the PRWeek Agency Business Report. On the heels of the most comprehensive such compilation in 2015 – with in-depth profiles of nearly 100 firms and rankings of 400-plus agencies across the globe – the 2016 version, which launched this week, digs deeper and reaches wider than ever before. In addition to the US, UK, and Asia-Pacific, the incorporation of firms from the Americas, Continental Europe, Africa, and the Middle East will be unprecedented. Revenue details will not only be offered regionally, but also by practice area and industry sector. Questions have also been added to highlight firms’ progress on women and diversity in the C-suite. 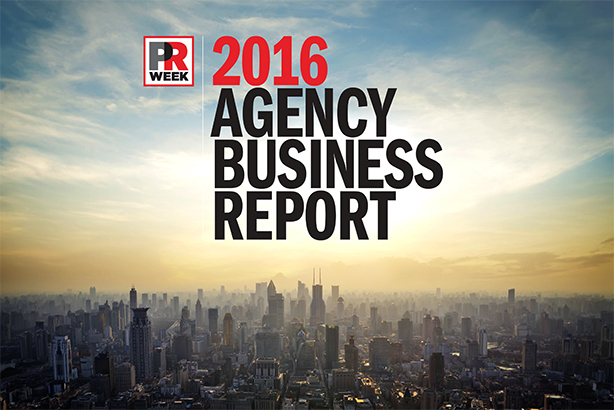 PRWeek has already sent the form to 600-plus agencies, including every firm featured last year. Anyone looking to submit their agency should check internally to see if the main global contact has already been sent the questionnaire. If you do not think your agency has received a form, please contact abr@prweek.com with your name, title, region, and contact information and we will send it to you or confirm who has received the form. The deadline to complete the questionnaire is Monday, February 15, at 5pm EST - the report will be published on May 1.